KobaP has been dropping hints about this year's Jump Festa event, scheduled to be held in December. 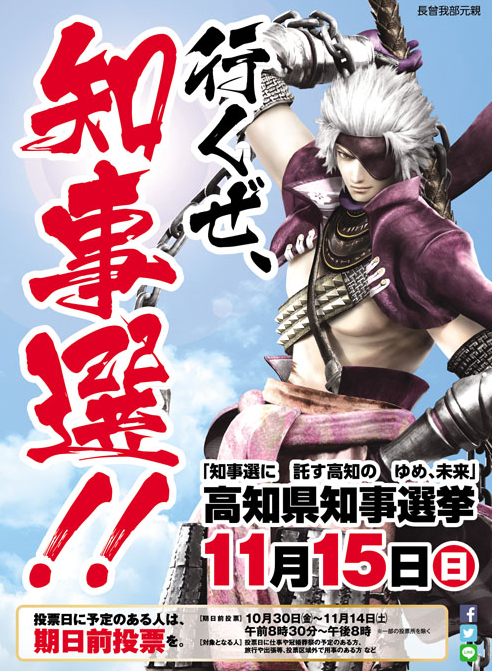 I don't expect any major Sengoku Basara announcements there, but it seems that there will be a stage presentation with the latest news. It's something to look forward to! This is being billed as a seasonal Halloween special offer, so imagine my disappointment when I opened the full article and saw that there were no new Halloween-themed costumes as part of the deal. Bah! Anyway, the purpose of the offer is to give customers who purchase sets of collaboration costume DLC a special bonus if they buy before 3rd November 2015. Each of the full sets of costumes (as shown at the link above) will be bundled with the DLC booster pack 'Weapons with inscriptions: 11 types, full set (large)'. The booster pack is worth ¥1,000 on its own so if you were planning on purchasing the DLC anyway and wanted to start off with some good weapons, it's a nice deal. 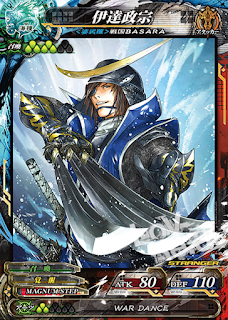 The other big news earlier today was that Lord of Vermilion Re:3 is welcoming Sengoku Basara's Masamune and Yukimura to its card roster. I was personally even happier seeing that the other game mentioned in the same announcement was Final Fantasy XIV - it's like they chose both of my favourite titles at once! 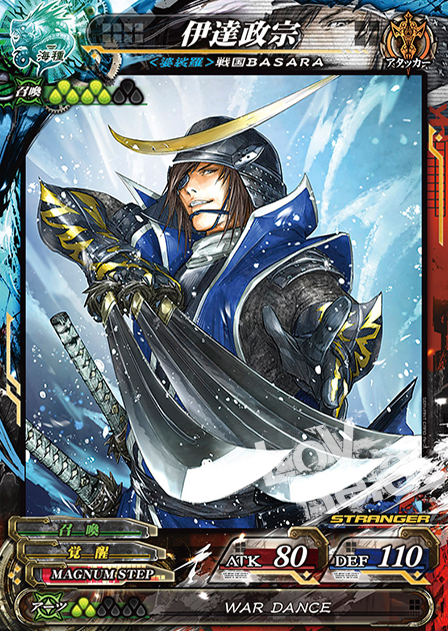 While the Final Fantasy XIV tie-in is two-way and not entirely unexpected, the inclusion of the Sengoku Basara cards is more surprising. It seems that the game is planning to include a large number of crossover characters this time around. 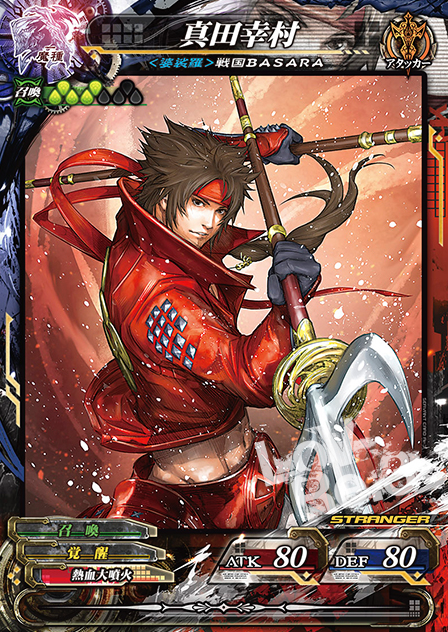 Both Masamune and Yukimura have been illustrated by Naora Yuusuke and they're armed with their famous signature moves, adapted to fit the Lord of Vermilion setting. There have been so many crossover illustrations over the last few years; I really wish they'd collect them all up in an art book for those of us who can't keep track of so many different card games. 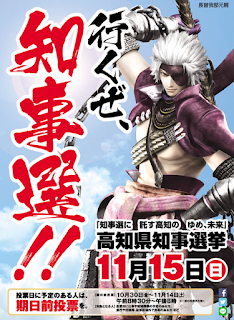 Another recent announcement (also available fully translated into English) is that Sengoku Basara's Chousokabe Motochika is the next character to use his considerable charisma to help publicise real-world politics. A major campaign is underway in the Kouchi area to raise awareness of the region's gubernatorial election on 15th November 2015, and Motochika has been selected to appear on posters throughout the area. The design is certainly attention-grabbing! 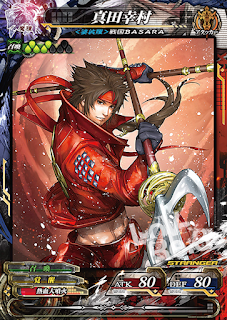 Fan OneSanitarium sent me a link to a great report recently via All Games Beta which is particularly interesting if you're an English-speaking Sengoku Basara fan. The latter parts (from page 103 onwards) are completely dedicated to the history of the series with plenty of behind-the-scenes anecdotes, making it the first official translated material we've had in quite a while! I'd already seen some of the information in Japanese interviews but the excitement of being able to see it all formally translated into English is a completely new experience. The writing style is quite candid and I think it gives a good impression of the challenges that the games' development teams have faced over the years. Do check it out if you get the chance. The original source for the report appears to be the Capcom investor page here. Amazon Japan has listed a mysterious new book titled Sengoku Basara Rival Fortune-Telling. It's priced at ¥1,404 and due for release on 20th November 2015 from Wani Books. Interestingly, artist Yupon is credited with providing the illustrations; I wonder whether there will be some new One Coin Grande figures which use the new designs one day? 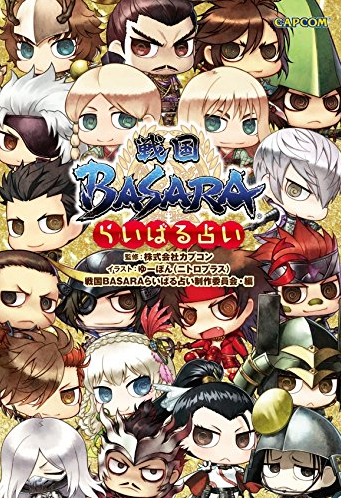 This isn't the first time that Sengoku Basara has inspired a fortune-telling book so the staff will have to work hard to set it apart from the previous volume. The listing explains that readers will be matched to one of 48 character types and given advice on work, love and future prospects. The team at Capcom TV paid the Densetsu No Sutadonya restaurant chain a visit as part of their news coverage for episode 29 of the show, and for those of us who can't participate in person the video clip they produced is probably the next best thing. The shop's manager talks the viewers through each of the dishes and points out how they designed the dishes to match particular warriors from the series. The report starts at around the 7:30 mark in the video. I loved the candid way they presented the story behind the series, it was so fun to read and full of character. It's a shame that Judge End was a bit of a flop but I hope they manage to bring us a lovely high quality anime adaptation again one day; it would be just what the series needs to attract more fans in Japan (especially now that TouRabu seems to have stolen most of them...). I NEED those One Coin Grande Figures made/released. Seriously now. This is my MOST WANTED SB related merch for quite some time. Take my money already, Kotobukiya/Capcom. Yes! They always seem to sell well and they're so high quality and cute. We need the rest of the cast to join the One Coin Grande army!